I started taking notes on a someday children’s book while my son was only 3. He inspired me with his relentless ponderings while in the back seat of my car. That age begins an important time for kids to start wondering about the world through their own eyes, and asking a lot of “what if” questions. My tiny notebook sat for a few years in the ‘someday projects’ category until 4 years ago. 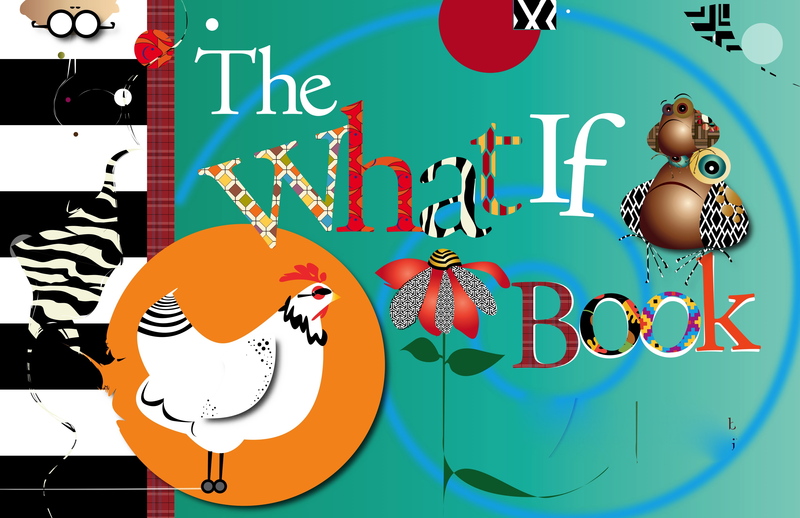 I sat down, put finger to keyboard and put my own twist on this theme to create The What if Book, a picture book for ages 3-7. It carries the reader through a modern, whimsical journey laced with a simple but powerful message; remember to dream. Working in the industry of fashion photo shoots and film, I tend to meet a lot of amazing, creative and talented people. One of these people is Carol Curley, an art director I’ve had the privilege to work with for many years. I had seen a bit of Carol’s art here and there, and had the strong intuition that she would be able to bring my book to life in the modern, edgy way I had envisioned. Carol was very excited about the project and began sketching away. Over time, she used the book as a creative outlet, finishing the remainder of the illustrations by sheer will and want. I am SO in love with what she’s created, and feel so lucky to have her on this project. I can’t express how talented, generous, humble, full of wit and grace this woman is! After really getting to know her over the last couple of years, she really has become one of the most inspiring people in my life. I’m so proud to call her my friend. Now, I hope this won’t have people sending her their manuscripts! She did make it clear to me that she doesn’t usually help fledgling authors in this way, but something about my book appealed to her and I’m so grateful. I think I sent about 30-40 letters out and 10-15 copies before Lulu was diagnosed in Fall 2011. And that was the end of that. The book, with all the time and love that went into it, sat on the shelf to collect dust. I thought about the book from time to time, and how the meaning of the book was so perfect for kids like Lulu, who needed a reason to dream, a little something to give them hope and inspiration. I decided that if I ever got the book published, I would use the profits for something related to our ordeal. I decided if (no, WHEN!) the book is printed that the profits would be split between The Go Bo Foundation; in honor of our friends Annika and Bo, and the loving message they continue to put into the world, and Love 4 Lulu; to help with her medical bills and to give to Childhood Cancer Research and support. Fast forward to last week. On a whim, I attended a seminar suggested by a friend on self-publishing through Kickstarter. I met some wonderful women there who were authors and illustrators. They were so encouraging regarding The What If Book, and one of the most impressive figures there took me aside after, and told me NOT TO GIVE UP. She thought I had something really great, and that it would be published. Well, meeting those women lit a fire under me, and I started a Facebook page the next day. I was told it is very important to gain a following. The page got 325 likes the first day! Over 400 by day 2, and still growing at 500 on day 3 today! I hope you will ‘like’ and share this page as well by following the link here: http://www.facebook.com/whatifyouaskedwhatif?fref=ts I will post the book’s progress on that page often. I must give a very special thanks to Carol Curley, who has generously decided to donate all her time and talents in illustrating this book to support our causes. She is a true gem of a human being and thank you doesn’t begin to cover it. But thank you Carol. It seems like the little-book-that-could, was just waiting for the right time and reason to be introduced … and so it begins. I must wrap up with a big thank you to Max and Lulu, who keep me believing, dreaming and asking … What if? AWESOME! THAT’S ALL I CAN SAY. AWESOME! Congratulations!!!! That is fantastic news! I remember when we read it to our class last year and the kids (and myself) loved it! I’m so happy for you! THANK YOU Kristen! Not published yet, but a big step in the right direction!!! Can’t you self publish? You need to send a copy to Ellen. She’d hook you up!! If you do try the self publish root lmk we’ll buy some copies and spread the word!! I thing Barnes and Noble may have a section. I am definitely looking into self-pub. I’m getting quotes now, but it’s pretty pricey! Especially when you factor in mailing/marketing. I had wanted to do a Kickstarter campaign, but it looks like I might not be eligible if proceeds go toward charity. The same goes to you Michelle, you are a Super Woman. Renee, I hope you can open and read it soon too! I appreciate the support and your stopping by to read the blog. Thank you!